After a holy youth devoted to serious studies of philosophy and the humanities in Venice, Lancelot Avellino was ordained priest by the bishop of Naples. He was assigned to the chaplaincy of a community of nuns, sadly in need of reform; his intrepid courage and perseverance finally overcame many difficulties, and regular observance was restored in the monastery. Certain irritated libertines, however, decided to do away with him and, waiting for him when he was about to leave a church, felled him with three sword thrusts. He lost much blood, but his wounds healed perfectly without leaving any trace. The viceroy of Naples was ready to employ all his authority to punish the authors of this sacrilege; the holy priest, not desiring the death of sinners but rather their conversion and their salvation, declined to pursue them. One of them, however, died soon afterwards, assassinated by a man who wished to avenge a dishonor to his house. He was still practicing law, which he had studied in Naples; one day a slight untruth escaped him in the defense of a client, and he conceived such regret for his fault that he vowed to practice law no longer. In 1556, at the age of thirty-six, he entered the Theatine Order, taking the name of Andrew out of love for the cross. After a pilgrimage to Rome to the tombs of the Apostles, he returned to Naples and was named master of novices in his Community, a duty he fulfilled for ten years. He was also chosen to be Superior of the house there, and then was sent out to found two houses elsewhere, at Milan and Piacenza. At the latter city he again met the opposition of libertines; but the Duke of Parma, to whom letters accusing him were directed, was completely charmed when he met him, and regarded him thereafter as a Saint. He then became Superior of the Milan foundation, where his friendship with Saint Charles Borromeo took root; the two Saints conversed together often. And Saint Andrew, with his admirable simplicity, confided to the Archbishop that he had seen Our Lord, and that since that time the impression of His divine beauty, remaining with him constantly, had rendered insipid all other so-called beauties of the earth. Petitions were presented to Pope Gregory XIV to make him a bishop, but he declined that honor with firmness, having always desired to remain obedient rather than to command. When his term as superior ended, he was successful in avoiding the government of another Theatine residence for only three years, then became superior at Saint Paul of Naples. Once when Saint Andrew was taking the Viaticum to a dying person and a storm extinguished the lamps, a heavenly light surrounded him, guided his steps, and sheltered him from the rain. But he was far from exempt from sufferings. His horse threw him one day on a rough road, and since his feet were caught in the stirrups, dragged him for a long time along this road. 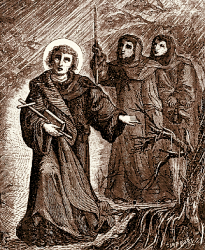 He invoked Saint Dominic and Saint Thomas Aquinas, who came to him, wiped his face covered with blood, cured his wounds, and even helped him back onto the horse. He attributed such episodes to his unworthiness, believing he was among the reprobate, but Saint Thomas once again came to him, accompanied by Saint Augustine, and restored his confidence in the love and mercy of God. On the last day of his life, November 10, 1608, Saint Andrew rose to say Mass. He was eighty-eight years old, and so weak he could scarcely reach the altar. He began the Judica me, Deus, the opening prayer, but fell forward, the victim of apoplexy. Laid on a straw mattress, his whole frame was convulsed in agony, while the ancient fiend, in visible form, advanced as though to seize his soul. Then, while the onlookers prayed and wept, he invoked Our Lady, and his Guardian Angel seized the monster and dragged it out of the room. A calm and holy smile settled on the features of the dying Saint and, as he gazed with a grateful countenance on the image of Mary, his holy soul winged its way to God. Reflection: Saint Andrew, who suffered so terrible an agony, is invoked as special protector from an unprovided and sudden death. Ask this holy priest to be with you in your last hour, and bring Jesus and Mary to your aid. Teach and admonish one another by psalms, hymns and spiritual songs, singing in your hearts to God.